okay I'm currently editing and working on a script so I will pick someone within the next day. I'm thankful to all of the reviews this week. Thank you everyone. Send your questions by this Friday, pls. Ah! Sorry! I went camping with my family for the weekend and I was TOLD there would be WiFi, but clearly the lies bury deep beneath everyone's soul. So, quick summary, this is probably the worst piece of writing I've ever written in my life (maybe a bit of an exageration, but the point still stands) and, ironically, I've spent the majority of my childhood working on it. How and in what ways could I improve my technique, especially in things like setting and dialogue? I would really like to know how to catch the readers attention without confusing them. Do you find any element of the story particularly interesting, and if so, what would it be and why did it interest you? What is the best and worst element of the story/writing? Like, what would you do if you were to write it yourself? Something along those lines. And, of course, any other notes you have that you think need to be addressed. So, without further a due, I give yee the finest of trash. I've honestly had a lot of fun writing it (which may be the reason why it seems weird), so I guess I don't mind if it stinks. I just hope I can get better in the future. Well, thanks in advanced and have a wonderful week friendos! Assignments are due in around two weeks! Hello! I read the first four chapters of your story! So, not everyone is a fan of the style, but the style in which you wrote the story reminds me a lot of minimalism--both in the way that there's a lot of space on the page and in the way that the writing style is very surface level and bare; it's sort of up to the reader to dig deeper and think through the deeper meaning of what's happening in the story. I'm not picky, so along with most writing styles I really love minimalism, and I like how the story is written. I like how we find out information through our main character's eyes and we get a really good sense of her attitude and where she is at in life in a very organic and natural way as the story moves along. There's a nice mood and atmosphere thanks to the way the story is written, and I like your concept, too. I'm curious about both her and her dad's obsession with the books and what happened to her dad. While I really like minimalism, I think using a style like this for a longer-form story can lead to some confusion. I saw some people in your comments section were sometimes a little confused about what was happening and who was talking which was understandable--although I personally didn't have the problem. I think you should add who the sentence whenever there is a line of dialogue even if it's just 'said', so nobody is confused about who's saying what. Some people were a little confused about the plot in the story, but I think that's easy enough to rectify through editing. I'm totally on board with a long-form minimalist story (whether you were intending it to be or not), but I do think you should think of a way to be more clear and concise with details relating to the plot. OMG, whoops. I forgot to follow the format of the book club, so I'll answer your questions, too, along with just giving my basic thought on the story. I actually think your dialogue feels fairly natural and realistic which is great! Your setting, I think, could use a little more detail. I would slow things down a little and have your main character describe the world as she moves through it. I already answered this earlier, but your concept is really great. I like the idea of this girl and her dad becoming obsessed with these books and I'm intrigued to know whether she is batty or whether there's something magical going on.This is a minor thing, but for some reason I really like that she was adopted and how you got that information across. I think I explained this above with how I loved how it was written in a very minimalistic style, but how it also led to some problems. As I said, I would definitely keep writing it in that style, but find ways to make it clearer what is happening in the story to the audience. For example, I got in your opening prologue that she writing to her daddy about these books he was obsessed with, but the flow of the story, I think, made it a little hard to understand. So, for those first few paragraphs, she's writing to her daddy, but then toward the end of the chapter where it reads, 'sorry for contacting you...' it's a little bit confusing about who she's talking about. Maybe there just needs to be a bridger paragraph there, but just little clarifications like that would be great~! I'm sorry for rambling (I hope I didn't annoy you too much) and I hope I made myself clear here about my thoughts on the story! Overall, it's really interesting and you should keep at it! Thank you so much! That was really helpful! I like to experiment with spacing and word placement and I never even put thought into how confusing it might be to readers sometimes, I'll definetly keep an eye on that. As for the prologue, clearly I've done something wrong that I'll probably have to go back and change, but the letter was meant to be written for herself, kind of like a diary, sort of. Again, really appreciate the feedback, I like hearing from the reader's point of view. Thank u! Happy Wuv Day! I plan to write out my feedback tonight. I will try to get my feedback in soon, I have been very sick the last two weeks so I haven't been able to do much. I'm just now starting to feel better. 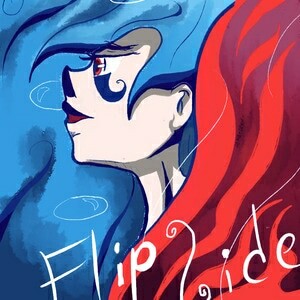 I read the first ten episodes of Flipside. It was not as much of a commitment as it sounds as these chapters were short and easy to digest. As I heard one reviewer say it on the Read It and Weep podcast, “This was a breezy [two hours].” I would have done this sooner, but I've been busy editing a different Tapas novel, and that other book needs a loooooot of work. Okay, the questions posed here are very broad, so I'll stop at 10 episodes and attempt to answer the questions with what I did read instead of pushing through. Well, there is a lot of personal preference involved in this question, but I'll give it a shot. From a technical point of view, there was one particular piece of dialog in which a character was speaking, but I didn't know who was talking until the end of the paragraph. That is okay if you have only two characters talking to each other, but it gets a little difficult to read with more characters. It can be solved by simply moving FRITZ SAID from the back to the front. Overall, I thought the dialog did an adequate job of establishing the voices and personas of the various characters. This is especially true of Shorty. Overall, I think the setting is not particularly unique for a portal story, but I am still fairly early in the story. I did like how you foreshadowed the weirdness slightly with the vanishing book text before the transition occurred. Did I find any element of the story particularly interesting? Yes, it's all about Shorty. She's a fascinating character and very untypical for genre. Instead of being an Alice or Dorothy attempting to instill logic and manners into a chaotic world, Shorty is the disorder and impulsiveness interjecting into a stable world. She was completely believable and slightly sympathetic even though her actions and intentions are thoroughly immature if not downright evil. What is the best and world element? Thanks for the review! I knew something was horribly wrong with the book I just needed to know what I feel better going back at it again now that I'm starting to get more feedback. Just a hypothetical question (and you don't have to answer since I ask stupid questions like this too much) but do you think the story would be better off as a comic? Or even just a shorter novel with lotsa pictures? I've noticed that I get better results in writing when I write something more concrete and this story has kind of a strange overall plotline. I feel it might not fair well as a book. Grace period time! Those of you who haven't left feedback (@kip, @SilverLugia456 and @storytimebiondi) will have this week to make it up. Afterwards, we'll move on to the much anticipated club feedback round! Hey hey, quick reminder that the grace period's nearly over! I know you've been sick tho (get well soon) @SilverLugia456 so if you can't make it dw. Are you guys busy as well, @storytimebiondi and @kip? Like I said earlier, I no longer have time for this group! It’s no problem! Thanks for understanding !